The Nano eNabler™ system is a highly flexible molecular printer that can dispense minute volumes of liquid at defined positions to create patterns of spots or lines with high spatial accuracy. 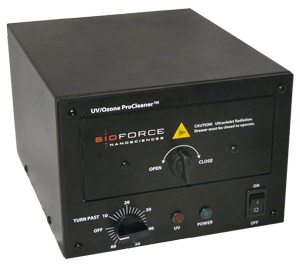 The system is based on BioForce's proprietary FEMTO (Fluidics Enhanced Molecular Transfer Operation) process. 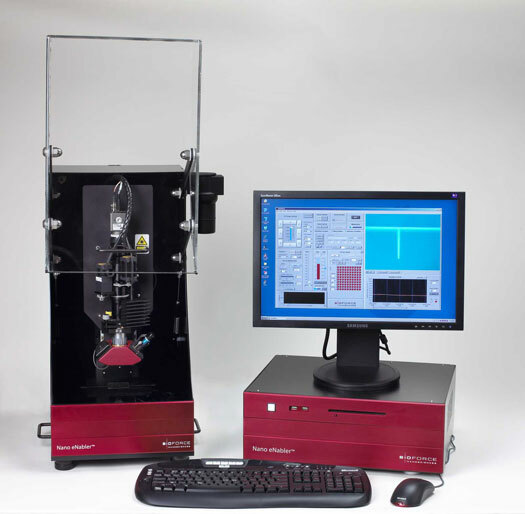 This technology enables the deposition of the 1-30 um sample droplets quickly, precisely and with reduced clogging. The core of the Nano eNabler system is a compact precision motion control platform mated to a microfabricated surface patterning tool (SPT™) with integrated microfluidics. Molecules to be printed are loaded into the SPT™ reservoirs by pipet for the ultimate in simplicity. A variable intensity laser and position-sensitive photodetector are employed to monitor the contact time and force between the SPT™ cantilever and the surface being patterned. In this way, the user is able to precisely control the volume of liquid being dispensed and the resulting feature size. Sophisticated electronics and a powerful user interface provide millisecond control over each deposition event. To ensure consistent printing, a constant humidity is maintained by an environmental chamber and computer-controlled humidifier. The entire process can be viewed through a high resolution optical zoom microscope and CCD camera with video displayed within the NanoWare™ software. To minimize the instrument’s footprint, the computer has been integrated into the controller. View all product videos here. © 2018 BioForce Nanosciences. All Rights Reserved.